Who Isn’t Doing Compression Therapy? Compression therapy is the go-to recovery method for you-name-it professional and collegiate sports teams, endurance and elite athletes. Olympic Gold medalist Simone Biles and basketball legend LeBron James recently posted pics of themselves undergoing compression therapy on social media. 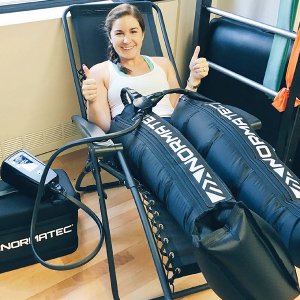 The Boston Ballet, US Rowing, and Ironman US Series, the NFL Giants and the NBA Celtics, USA Cycling, USA Triathlon even pop star Drake in an Instagram post, are all onboard with compression therapy and the NormaTec boots in particular. Forbes magazine says Drake is a fan, not an official rep. NormaTec CEO Gilad Jacobs said the hip-hop superstar was not compensated; he just really “does love his NormaTec.” Jacobs went on to say hundreds of his massage compression therapy boot devices were used in Rio’s Olympic Village. And the system has been featured widely in the media from Bloomberg to Wired magazine. Simply stated, compression therapy increases blood flow in your limbs which greatly helps in recovery. Through graduated compression from the ankle up, where there may be restricted blood circulation, the pressure and contraction helps to loosens veins, reduces pain and promotes recovery. The principle of this therapy is to exert a controlled pressure on the limb. MannyTurcotte from BluFit can tell you. So can Dr. John Lieurance from Advanced Rejuvenation and myriad other local recovery and rehab venues, including IMG. you experience during a massage, as a pulse and then a release. This will repeat for each segment as the compression pattern works its way up your limb. Besides recovery, some of the claimed benefits of compression therapy include the reduction of inflammation and pain, it removes toxins, improves circulation, decreases accumulated water in the limbs, that ‘heavy leg’ feeling, and may assist in preventing the development of cellulite and can tighten loose skin. “Compression therapy is a great way for athletes to recover,” Manny Turcotte of BluFit Recovery and Nutrition, says. BluFit features 30 minute and one-hour sessions with the compression therapy NormaTec system. At Advanced Rejuvenation, Lieurance says that while the benefits of compression therapy are many and widely studied, it’s a seefor- yourself recovery method. To check it out for yourself or get more information, visit blufitrecovery.com or advancedrejuvenation.us.